Obviously this outfit was shot back home in SF but I did wear this exact outfit for day one of ACL last weekend and wanted to share the look with y'all! W and I just had a little slower start to the morning last Friday as we didn't land in Austin until midnight on Thursday so we didn't get around to shooting the outfit before heading into the festival. 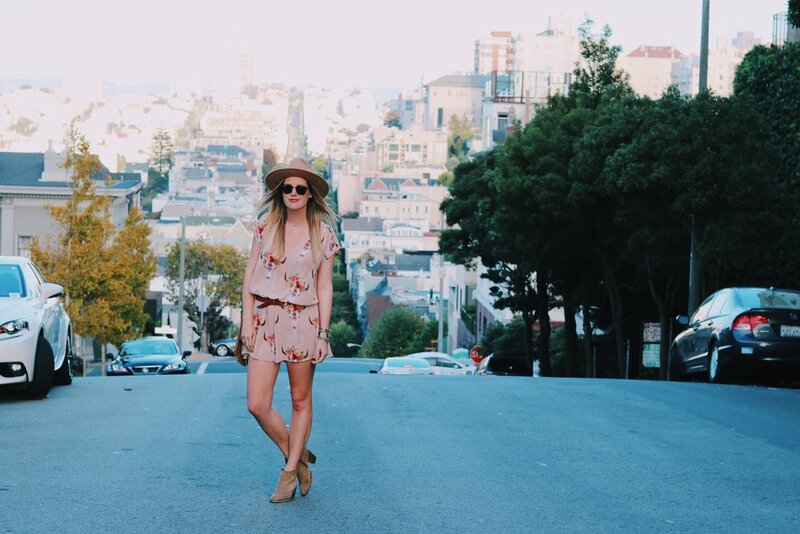 I cannot even begin to tell you how many people came up to me asking me where I got this romper! 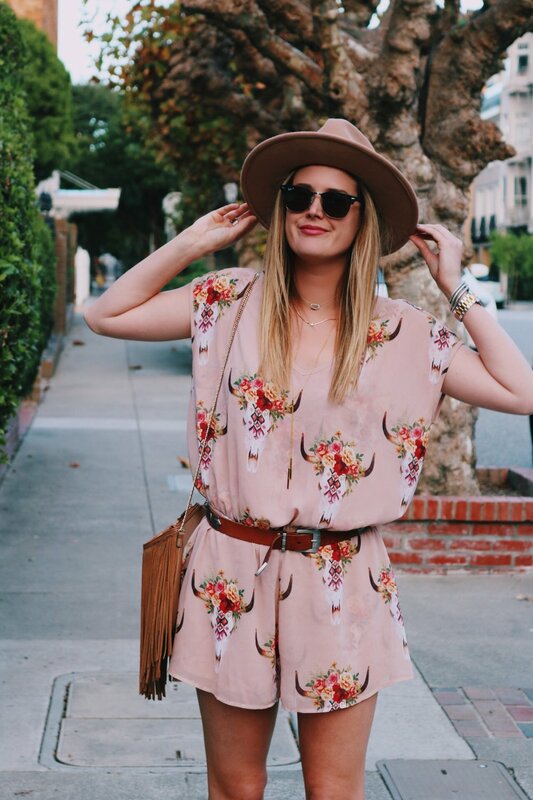 It's seriously the cutest romper with the floral bull print. 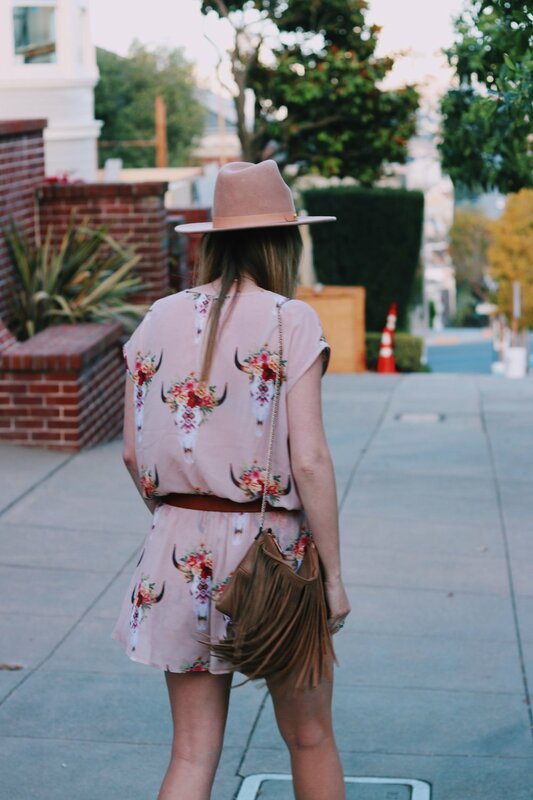 Rompers are one of the comfiest outfits to wear to a music festival however they are definitely not the easiest when using the bathroom! Haha. I still can't believe that this year was the 15 year anniversary of Austin City Limits. I cannot say for sure when I started going to the festival but I'm almost positive it was either in 7th or 8th grade and I have pretty much gone to the festival every year since then! It's crazy to look back and see how much Austin has changed over the years. A once hidden gem of a city is now one of the most popular cities in the states with 110 new people moving to Austin every DAY! Isn't that crazy?! To note, listed below are some of my favorite artists W and I saw at Day 1 of the fest! W and I ended up seeing Major Lazer over Radiohead and I am so mad that we did. Major Lazer was such a disappointment and I probably should of educated myself in his music a little more beforehand. I definitely do enjoy DJs but he was all EDM, which I seriously dislike. I admire a good beat but everything he put out was just awful and made my ears hurt. W and I actually ended up leaving the fest early because we just couldn't take his music anymore! But luckily this was the only disappointment of the whole weekend. Stay tuned for day 2 recap on the blog tomorrow!